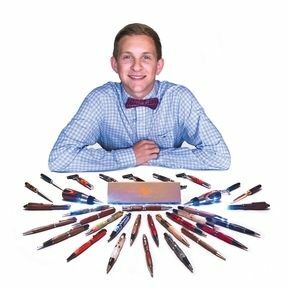 The JP Pencil is named after Graham’s superintendent at school who prefers using pencils over pens. JP was the first recipient of this GSD pencil as well. We are a family-oriented, loyalty-driven, self-made business. We use recycled wood whenever possible and have gotten cedar, oak, maple and various other woods from our grandfather’s farm, from cabinet makers' leftovers, neighbors’ scraps, friends who have cut down trees, and whoever else has wood that we can reclaim and use. Graham orders and pays for all of the supplies and makes all of the final decisions for every piece himself. Our products are all turned and assembled by hand in Texas. We inspect every item to ensure the highest quality and craftsmanship before putting it on the market. If that wasn't enough incentive, with this business, Graham is hoping to earn enough money to pay for his college tuition. I am writing you because I happen to be in east Texas visiting, and this morning, low and behold, there's Graham on the news!!! And it just so happens that I write my novels by hand. I needed a new pen to finish the current novel, and another cool pen for the next novel. So I bought two pens at Louis Morgan today!! The quality of the pens is amazing. I was interested because I know him, but it was the craftsmanship that made me buy two! I am 16 years old and the youngest of 3 sons. When I was in 7th grade my mom wouldn't let me take Shop Class because she said when she was in school all of the rowdy kids were in that class. I told her it's not that way now and begged her all semester to let me get in Shop. After months of pleading, my mom finally gave in over Christmas break and let me switch classes! I learned how to use a wood lathe my first semester in Shop Class. I loved making pens so much I told my parents I wanted a lathe. They told me to save my money. I don’t think they believed just how serious I was till I cleaned up and organized my late grandfather’s little shop building in 100 degree weather last summer. I then talked my grandparents into giving my birthday money to me 2 months early, so I would have my very own lathe! 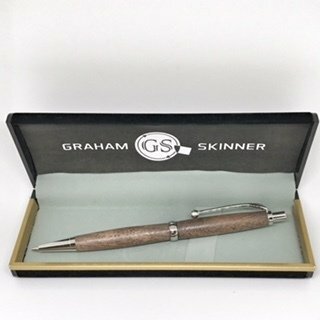 When my parents saw the first pen I brought home, they were shocked and encouraged me to make more, so that I could sell them. So I did, and I am! View more Reviews on our Facebook Page! Want to see the products in Person? LOUIS MORGAN DRUGS # 4 in Longview carries our products in store as well. So, if you are in Longview, stop on by and you can see our pens, razors, wine toppers, and more first hand.